As an increasing number of local and regional transportation agencies across the country are committing to the vision of eliminating traffic fatalities and serious injuries on their roadways, many local agencies and metropolitan planning organizations (MPOs) are developing and implementing their own transportation safety plans. 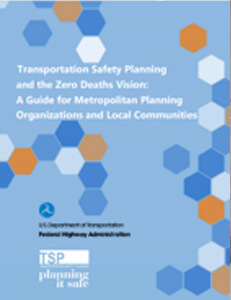 To assist these and the many others that are considering adopting the same vision, FHWA is pleased to share a new resource, Transportation Safety Planning and the Zero Deaths Vision: A Guide for Metropolitan Planning Organizations and Local Communities, which will be available in September on the FHWA Transportation Safety Planning web page. This guide is designed to assist MPOs, local communities, and stakeholders in using the safety planning process to work toward the zero deaths vision. It provides a step-by-step process to develop, implement, and evaluate a regional or local safety plan and highlights noteworthy practices. The guide also presents safety considerations necessary in the safety planning process in order to reach the zero deaths goal. In addition, it offers suggestions on how safety practitioners can engage in safety planning efforts, analyze data, set goals and targets to facilitate performance-based planning, identify strategies to address safety challenges, prepare a document that presents the plan, and evaluate the effectiveness of the plan. For more information on how transportation safety planning can help your locality or MPO reduce traffic fatalities, please contact Chimai Ngo.